MG McGrath Architectural Surfaces and MG McGrath Architectural Glass & Glazing have achieved the Construction Health and Safety Excellence Minnesota (CHASE) Level 3 award from the partnering program of Association of General Contractors of Minnesota (AGC of MN) and the Minnesota Occupation Safety and Health Division (MNOSHA) of the Minnesota Department of Labor and Industry. Level 3 is the peak level of MNOSHA compliance partnerships. Both MG McGrath companies achieved this award after demonstrating outstanding safety performance by all employees to decrease injuries and fatalities in the construction industry. 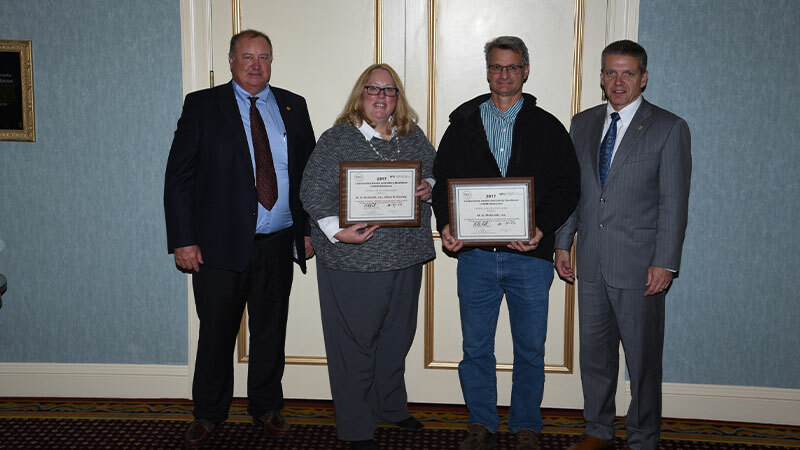 Tom Schoenecker and JoAnn Toth represented MG McGrath while accepting the awards on behalf of our companies! To reduce by 3 percent annually (see MNOSHA’s strategic plan) the number of injuries, illnesses and fatalities affecting participant employers, with a focus on eliminating injuries and fatalities resulting from those hazards that are the four leading causes of death on construction sites (falls, struck-by, caught in or between, and electrocutions). To recognize those contractors where managers and employees work together to develop safety and health management systems that go beyond basic compliance with all applicable OSHA standards and result in immediate and long-term prevention of job-related injuries and illnesses.